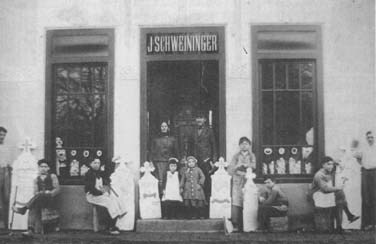 Occupations: the oldest Bricklayers Union is in BOGAROSCH; PERJAMOSCH is the birthplace of most scientists; the best village mill is in ORCYDORF; the best bone doctors are in KLEINJETSCHA; the best exhibition was in LOVRIN; SADERLACH has the most teachers; SACKELHAUSEN has the most parsons; LOVRIN has the most medical doctors and BILLED the most pharmacists. This commentary is found in the 1924 Donauschwäbischer Volkskalender, titled: Our Danube Swabian Banat Villages Have Their Own Character By Prof. Nischbach, subtitle: Various characteristics of the Banat Swabian Villages. A sign of an intellectually worthwhile life of a village are always the social and cultural associations. The oldest association of our community is the Trade Association, frequently also called Zunft (Guild), Innung (Guild), or Meister (Master Craftsman) Association. 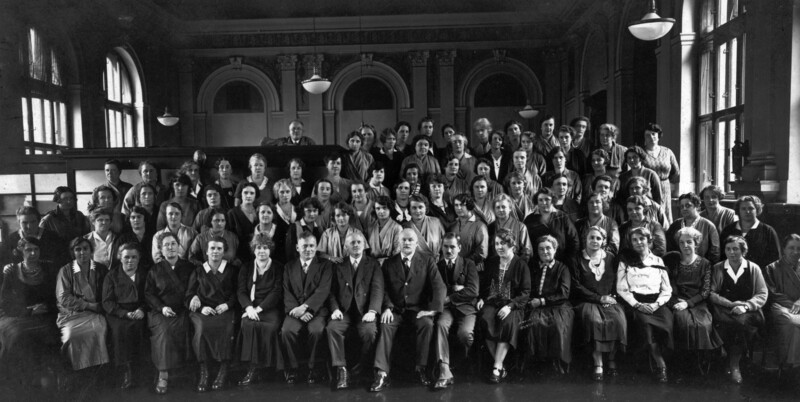 It was a beautiful entertaining life that the association led, at different formal events, but especially at the annually held general assembly where all the fellow shopkeepers were met by the guild master with village music and after the assembly they were accompanied back again by all of the members of the association with music. It also happened this way when the master craftsman held a ball. The association – called Zunft (Guild) in the beginning issued apprentice and master craftsman letters, but lost its privileges in 1867. It remained, however, under the name as a social association until 1877, then it operated until 1897 as Association of the Business Enterprises. "Wheat, Barley, Oats, Rye, Corn, Feed Crops, Red Clover, Beets, & The Farmer's Work Year"
"Cattle, Sheep, Swine, Horses, Chicken & Geese, Goats, & Storks"
Hemp Industry in Batschsentiwan by Hans Kopp - "After WWI, export firms of Batschsentiwan delivered not only to countries in Europe but also throughout the rest of the world." Gingerbread Maker (Ger. 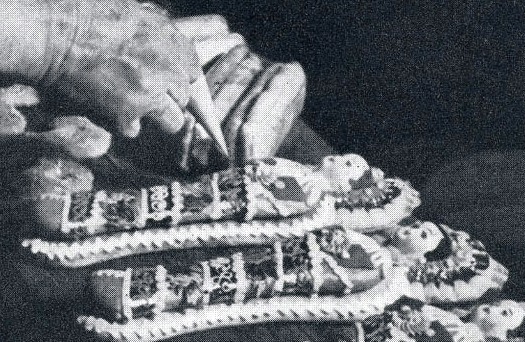 : "Lebzelter") Here he is decorating a pastry "Lebkuchen" (earlier called "Lebzelte"). Those are the spicy cakes made with honey and nutmeg, and he is in the process of decorating them with liquid sugar (sugar and egg white?). Photo contributed by Hans Gehl. The daily shaving, whether electric or wet, is understandable for men today. In Bulkes it was different. In Bulkes a man “ballweere” himself, that is, shaved. One did not go to the barber shop like today to have his hair cut or perhaps be shaved. The Ballweerer came to his customer in his home. With his own “Ballweermesser” (knife), one “ballweerte” himself only in exceptional cases. In the summer, when my father, who was a farmer, worked all week on the Sallasch, he “ballweerte” himself there. Once or twice a week the “Ballweerer” visited his customers. Weekday and day times were permanently arranged. Only the doctor, the pastor, and the teacher “ballweern” themselves daily. For the farmers he already came early around six or first thing later in the evening, when they came home from field work. Once a month on the “Ballweerer” day he also cuts customers’ hair. His work tools were a soap bowl made of porcelain with the lather brush in it, and the different Ballweermesser (knives) for the varying beard strengths of his customers wrapped up in a leather or linen case. 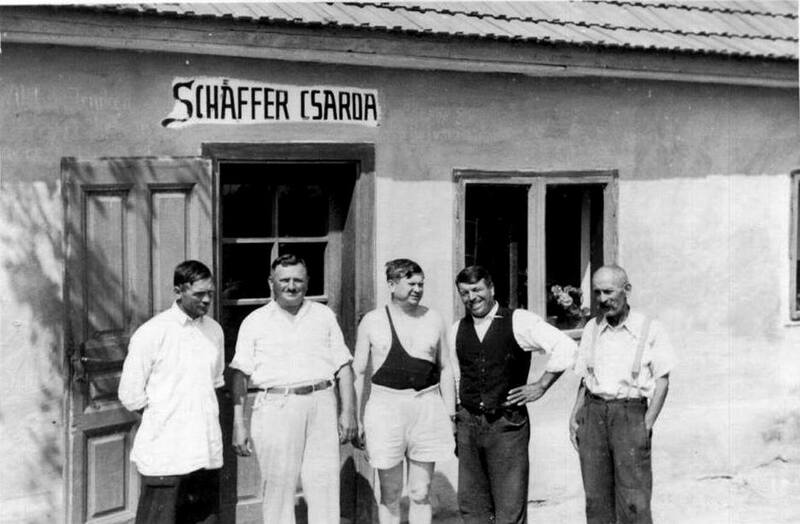 Membership Photo: Hairdressers from the Banat were 1907 cofounders of the Association of Banat Swabians. 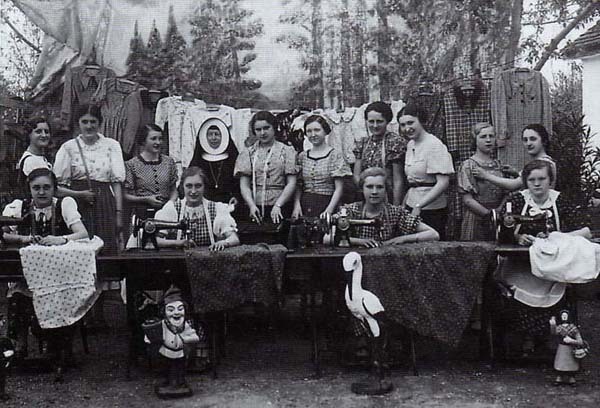 Shown here is a hairdressing competition. In addition he brought the whetstone and leather strap with which he gave the knife the last cut. He brings all this in a wide leather bag with a brass handle and snap fastener to his customers. Occasionally he also has an apprentice with him. The apprentice then gets the lather while he selects the right knife for the customer’s beard growth. 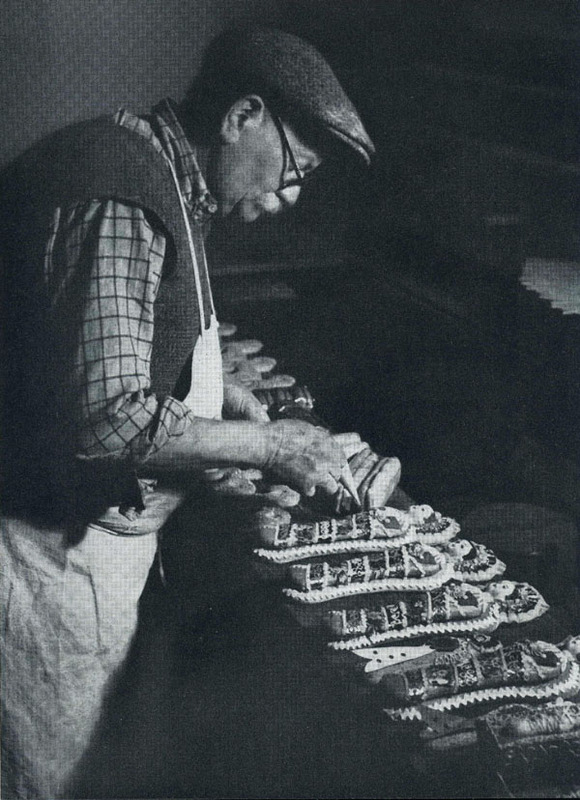 Before he begins with the Ballweeren, he sharpens the knife on the whetstone and then on the strap. Like a living village newspaper he tells all the news of the world and the village to his customers. He was the local paper and the world paper at the same time. The soap foam abballweerten (shaved up) with the beard hair in it he places in a flat tin can he also brought with his Ballweermesser (knife). This had a folding lid without a fastener. In the end he wiped the remaining foam off the customer’s face with a cloth, rubbed the cheeks with alum stone, and quickly went on his way to the next customer. So he could keep his arranged dates during the warm time of the year he grasped the handgrips of the handlebar with both hands while standing behind the Bizikel (bicycle), placed his right foot on the spike of the extended rear wheel hub, pushed off with his left foot, and swung himself over the rear wheel into the saddle which squashed the feathers under the sudden weight. During the trip the tin can swung in his hand so that the folding lid opened and the foam with the beard hair flew in the street dust or also on the trunk of the next mulberry tree. In the winter when everything was covered in snow and it was cold, he came on foot. Often I liked to watch the Ballweerer as a child when he grasped the nose of my father and grandfather with the thumb and index finger of his left hand, pulled it up and with the always sharp Ballweermesser (knife) wegballweerte (shaved away) the foam with the beard hairs downwards by the upper lip. Frequently father and son each had his own Ballweerer. The Ballweerer was paid by the farmers with produce like wheat and Kukrutz (corn). He received cash from the customers who he “ballweerte” daily. As a second occupation the Ballweerer was as a rule a musician. His apprentice he trained to be a Ballweerer and naturally a musician as well. 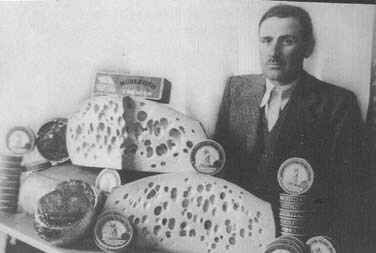 During the harvest time he was also active with the farmers as a day laborer. According to the list in the Bulkes homeland book, of a total population of 2,860 in the year 1945 there were 17 Ballweerer in Bulkes. There were no barber shops. 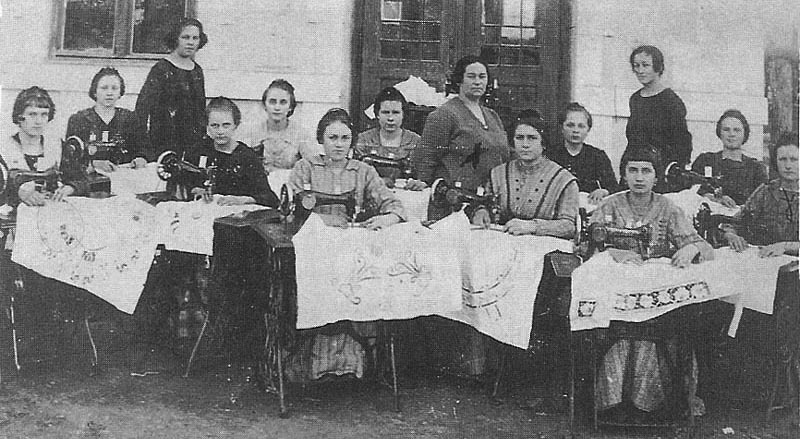 The women wore “Gretchenfrisur” (chaplet hairstyle). The long hair was braided in two braids and laid counter-clockwise on the head. Few women who already had a modern hairstyle had to ride the train to Neusatz to the ladies’ hair salon. 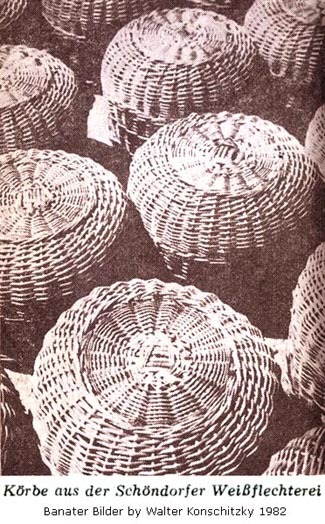 "Basket weaving" was a part of Schondorf history from the colonization beginning in 1768 with the family of Johann Logel. In 1828 census there were 4 'korbmacher' (master weavers), surnames of Frensch, Grunzweig, Lui & Scharle. 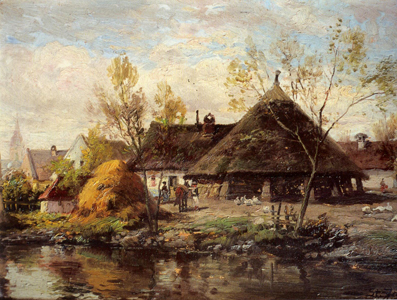 Hangai, Wersching and Mayer are 'korbmacher' in the 1850's. 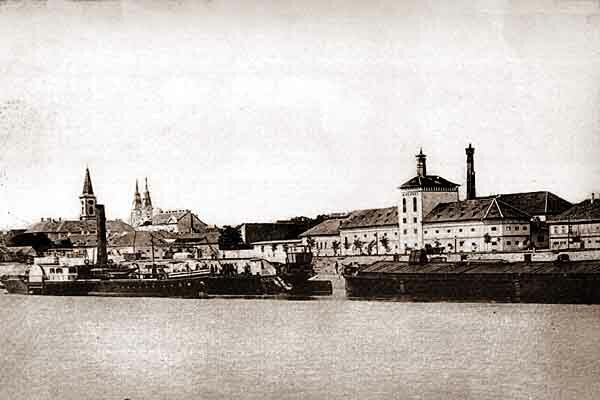 From 1900 to the start of World War I was a very prosperous time for the industry with over 70 workers. After WWII saw the introduction of a communist, state run co-op with building additions in the 1960's. 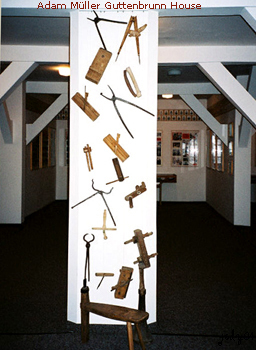 Fine brushes producer. 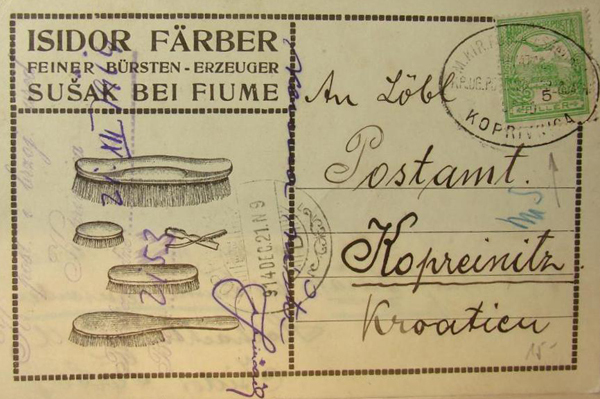 Card sent to Kopreinitz, the German variant for Koprivnica, a city in northern Croatia. 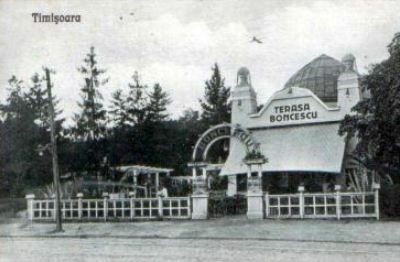 It is the capital of the Koprivnica-Križevci county; the Hungarian translation is Kapronca. 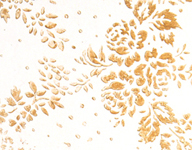 Another variant is Kopriwnitza. 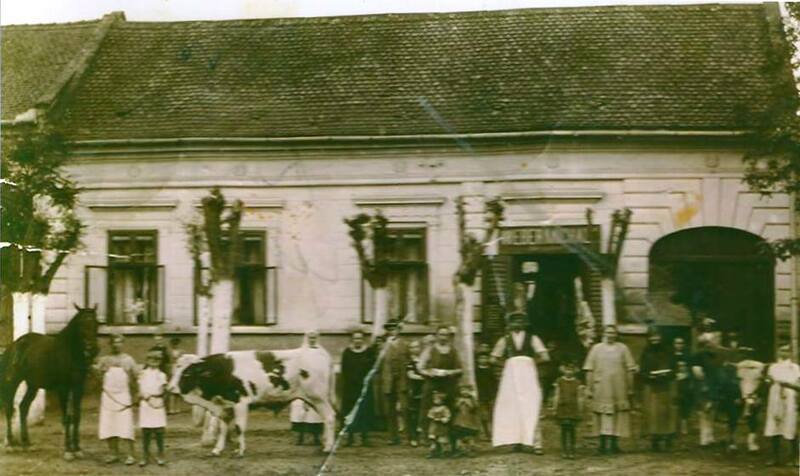 Sandra Burns: This butcher shop in Hatzfeld, believed to belong to my Great Uncle Mihaly Webers' (married to Anna Wildermuth). I'd like to know the location of it. 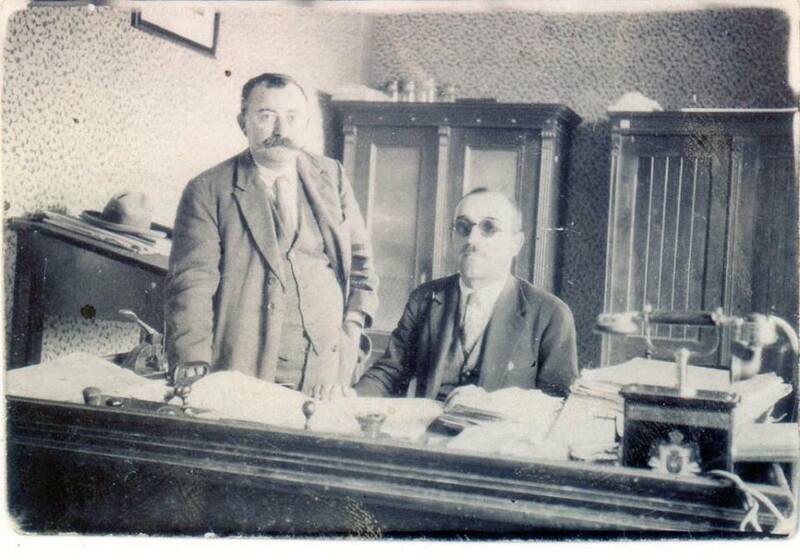 Clerk of Court My Great grandfather (seated) Franja (Franz) Strk at work in his office. He was like a clerk of the court, not a judge though. One who makes or repairs vessels made of staves & hoops, such as casks, barrels & tubs. Barbara Anne Teves Schaeffer: Schaeffer Dental Office in Karavukovo. 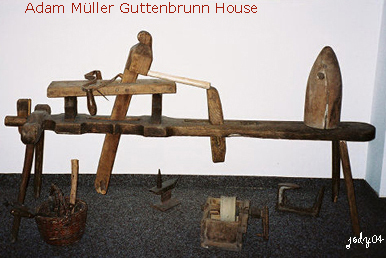 A horse mill consisted of two adjacent buildings: the horse-capstan (German: Göpel) building and the mill house proper. The first one was a large round building with a cone-shaped roof of cane or straw. 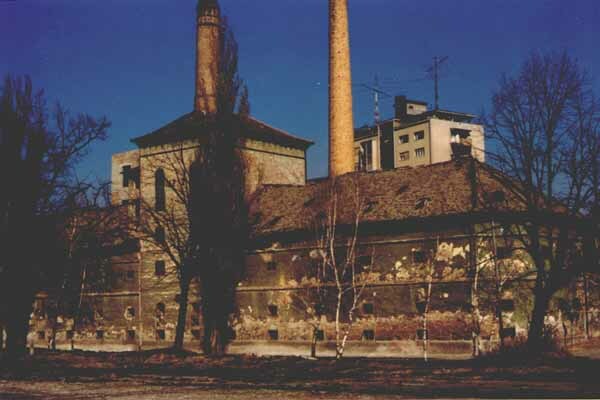 Inside this building there was the horse capstan, a horizontal cross-shaped yoke attached to a very strong vertical axel. The horses were harnessed to the arms of cross-shaped yoke; by moving round and round in a circle, they turned the vertical axel, the motion of which was transmitted via a horizontal intermediate axel and two angular gear sets to the milling mechanism in the second building. 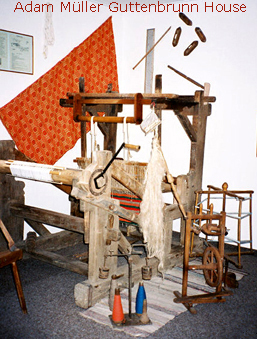 The axels and gears were made of wood, and the whole complicated mechanism was certainly a masterpiece of the village tradesmen. 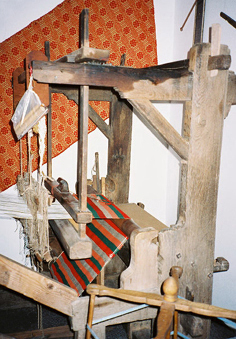 Spinning and weaving are associated occupations. 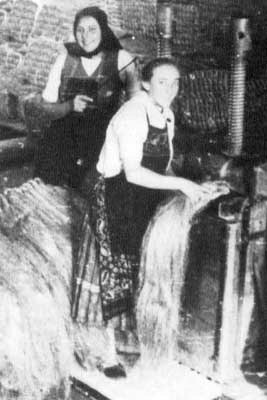 Flax (Flachs) required a great amount of processing to prepare it for spinning. 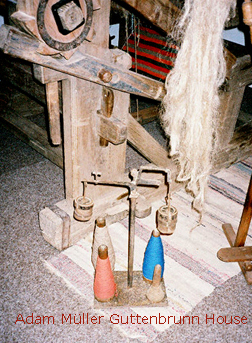 In America, each family spun and prepared their own wool and flax. 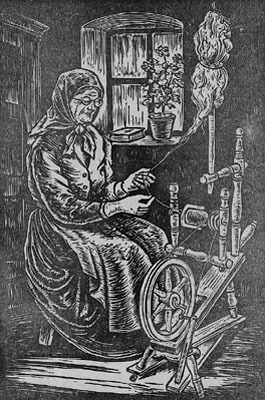 Then, the weaver (who traveled from town to town) would come and weave the wool yarn that had been spun into [wool] coverlets and blankets, fabric for making clothing, etc. 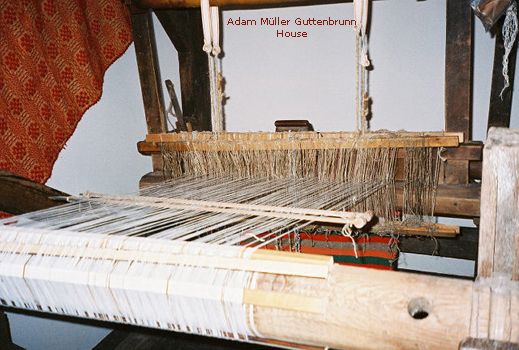 The spun linen or flax was woven into fabric for making clothing, towels, sheets, etc. Hans Kopp's excellent information on the processing of hemp is identical to the process used to prepare flax for spinning. 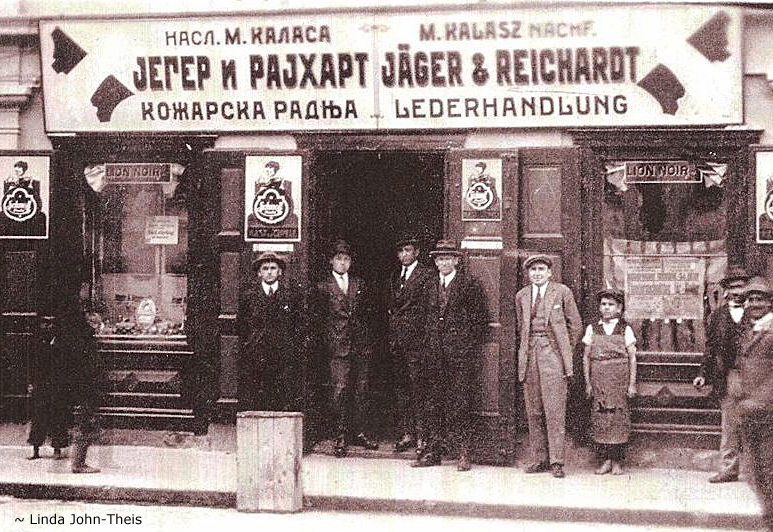 Lederhändlung: Leather dealer business Linda John-Theis: My grandfather, Michael Reichardt, leaning in the doorway of his Leather shop in the 1930s, downtown Vrsac (Werschetz), Yugoslavia, now Serbia. We were not able to establish when exactly the breeding of silk worms was introduced in our village. It was a very beloved economic activity in the 18th century. We know that emperor Joseph the 2nd – like his mother – has brought in Banat specialists from Italy in order to spread this branch of the agricultural production. In those periods many people bread silk worms (even well to do peasants), because it was an easy activity for the families with many children, which needed an additional income. For years 1880-1902 we have accurate information about the breeders and their success in the Banat and Arad counties. 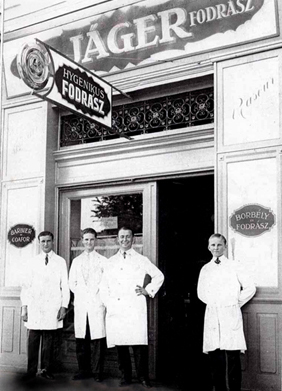 In 1892 the Moritzfeld village arranged one and a half-acre of land as tree nursery. Here they mainly cultivated blackberry bushes. 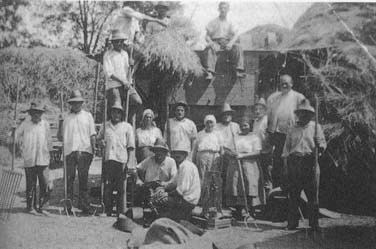 The tree nursery was maintained by a nursery worker paid by the community, under the supervision of teacher Nikolaus Kolb. 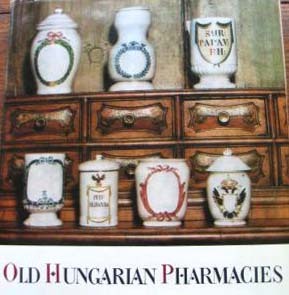 The inspectorate for silk in Szekszard supplied the villages with silk worms and tried to get breeders everywhere. 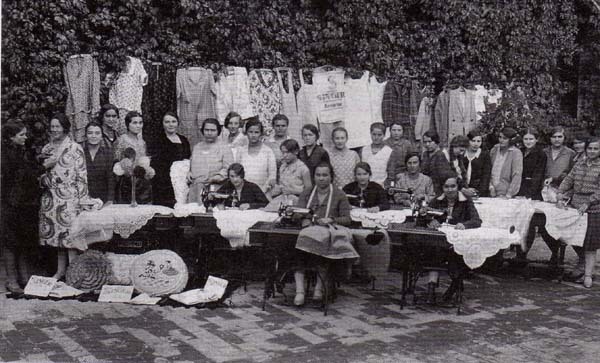 In 1896 in our village 165 persons dealt with this activity, in 1910 there were only 105 persons. In some years they were able to get between 1500-2500 kg of cocoons and received an average amount of 4000 Kronen (2000 Florins) out of sales. It was for sure a welcomed additional income. Thresher – (Owner) & Threshing Machine Drescher & Dreschmaschine Dreschmaschine means threshing machine. North American farmers use 'combines' which pick up the mowed -- or standing grain as they drive through the fields. The self-propelled combines remove the grain kernels, wheat, barley, oats, canola, beans, clover and flax and leave the straw as they drive through the fields. The straw is later baled and used as bedding for livestock and sometimes fodder (feed). Town Drummer Trommler The Der Trommler / The Town Drummer / Crier - "HEAR YEE!, HEAR YEE!." "Town Crier," would walk to every corner of the town, ringing a bell until the crowd gathered around him, then he would yell out, - "HEAR YEE!, HEAR YEE!." Then he would present his message in a singing tone. He was known as the "Messenger." Since the people in the villages didn't have radios, the community hired a messenger. He would get the message from the community City Hall. He had a drum and went from corner to corner in the village. He would drum for a few minutes to give the citizens the chance to come out to the street and listen to the news being delivered by the drummer. He delivered his message in a shouting singing tone. The message being delivered, concerned the local people, whenever community work had to be done, on a volunteer basis. 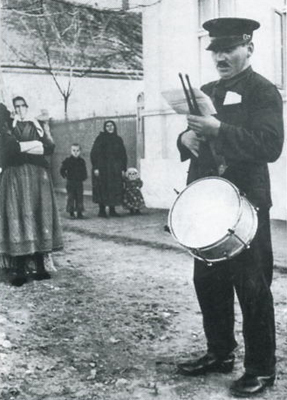 The man was known as the Town Drummer, or "Der Trommler." He should be called the "Town's Singer" instead of the "Town Crier." It would be hard to cry on every corner.